3-11-18, President Trump released the FY 20 Federal Budget proposal (dollars for the 20-21 school year). Click HERE for a 4 minute video produced by Federal Flash explaining the budget proposal impact education. Click HERE for AASA's response to the budget proposal. On 10-7-18, on behalf of SAM, this STATEMENT was submitted to the IRS on the SAM position to close the school voucher program tax shelter. In October 2018, for the first time in two decades, Congress has passed a funding package for the Department of Education on time! This is helpful to our schools in Montana for federal funding planning purposes going forward. The House and Senate voted on a compromise package that was sent to and signed by President Trump. Find a rundown of the process here. Funding for the Department of Education is $71.5 billion, an increase of $581 million. The final bill rejects the proposal to consolidate USED with the Department of Labor, as well as the Trump/DeVos privatization agenda. The bill does NOT include language to prohibit the use of federal education dollars to arm school personnel. On 3-23-18, Congress passed HR 1625 the FY18 Omnibus Appropriations Bill (awaiting signature of the President at the time of this post 9:00 AM MST). Specific to education, the bill provides a $3.9 b increase to USED, providing a total of $70.9 b for FY18. Click HERE to read the AASA Analysis of the FY18 Omnibus Appropriations Bill. On 3-16-18, U.S. Senator Jon Tester and Governor Steve Bullock are calling on the Federal Communications Commission (FCC) to update a program aimed at bringing broadband to rural schools, following a report that applications are facing long delays and denials. Tester and Bullock are urging FCC Chairman Ajit Pai to reform the E-Rate Program, an FCC initiative that provides discounts on telecommunications services to schools and libraries, to cut red tape and ensure Montana students have access to high-speed internet. Click HERE to read mere about this federal request supported by SAM. On 3-14-18, U.S. Senator Jon Tester introduced the IDEA (Individuals with Disabilities Education Act) Full Funding Act during #PublicSchoolsWeek. Click HERE to read more about this federal legislation supported by the SAM. On 1-18-18 Senator Tester sent a RESPONSE LETTER to the US Department of Education’s request for information regarding the needs of rural schools. It raises three issues that our SAM members have highlighted in recent months: recruiting and retaining educators, the application requirement for REAP funds, and OCR complaints against schools’ websites. On 1-25-18 Senator Tester's office created this Press Release. The AASA Advocacy Update January 2018 provides a good overview of the Federal Issues impacting education as we begin 2018. On 1-8-18, Montana Public Radio reports Federal Tax Cuts Could Make Montana Special Session 'Strong Possibility'. On 12-22-17, the President signed the Tax Cuts and Jobs Act 2017 (check out the Wikipedia outline of the bill). The final conference bill will impact Montana, read Gazette Article Fed Tax Break Impacts on MT 12-24-17 for an overview of these impacts. As of 12-18-17, many concerns about the impact on public schools in the Conference negotiations of the Tax Cuts and Jobs Act led AASA to join with other national education organizations to oppose the bill -- read the details at AASA Call to Action to Kill the Tax Bill 12-18-17. Because of the potential impact of the Tax Cuts and Jobs Act 2017 on Montana's revenue and budget picture Governor Bullock appealed to the Montana Congressional delegation to watch out for Montana -- read the details at Gov Bullock Federal Tax Reform Letter to Congressional Delegation 12-11-17. As of 12-8-17, the House and Senate have passed their version of the Tax Cuts and Jobs Act and the bills are going through the process of conference. The AASA advocacy team created an AASA Tax Summary 12-7-17 document, providing a good overview of the potential impact of the legislation on education. The state of Montana is also working to understand the impact of the Act on Montanans outlining a potential reduction of state revenues by $122 million per year (Gazette opinion_ How will Montana pay for new tax plan 12-8-17 and Tax Cuts and Jobs Act of 2017 MDOR Memos 12-4-17). 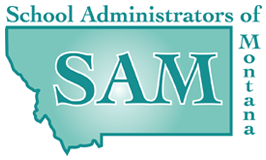 SAM continues its advocacy for education to minimize the impact of federal tax reform on Montana schools. SAM Federal Advocacy Team responded to a 'Call to Action' to vote No on tax reform (Tax Cuts and Jobs Act) that reduces support for public education. On 11-16-17 SAM and affiliate associations sent emails to the Montana Congressional Delegation in response to the 'Call to Action'. Sample emails sent -- SAM Input on Tax Cuts and Jobs Act to Sen Tester Email 11-16-17, SAM Input on Tax Cuts and Jobs Act to Sen Daines Email 11-16-17, and SAM Input on Tax Cuts and Jobs Act to Rep Gianforte Email 11-16-17. SAM received a LETTER on 10-24-17 from Senator Daines requesting input on federal tax reform. The SAM Federal Advocacy Team, on 11-1-17, submitted this SAM LETTER responding to the request. October 2018 ... For the first time in two decades, Congress has passed a funding package for the Department of Education on time! The House and Senate voted on a compromise package that was sent to and signed by President Trump. Find a rundown of the process here. Funding for the Department of Education is $71.5 billion, an increase of $581 million. The final bill rejects the proposal to consolidate USED with the Department of Labor, as well as the Trump/DeVos privatization agenda. The bill does NOT include language to prohibit the use of federal education dollars to arm school personnel. On 1-16-18 the SAM Federal Advocacy Team, approved MAEMSP and MASSP to sign on to the Raise the Caps TItle II - State Affiliate Sign on Letter NASSP NAESP 1-16-18 intended address the raising of the federal budget caps to allow increases to the Non-Defense Discretionary (NDD) spending which in turn would fund education programs like Title II in the non-defense discretionary portion of the federal budget. SAM Federal Advocacy Team responded on 11-9-17 in writing to ask Congress to act quickly on H. R. 2340/S. 1027 to extend and fund the Secure Rural Schools and Community Self-Determination Act (SRS). SAM and all affiliate associations (MASS, MASSP, MAEMSP, MACSS, MCASE, META) signed on to an SRS Coalition House Letter and SRS Coalition Senate Letter . The SRS program provides critical bridge funding for forest counties and schools. We are urging Congress to act in a bipartisan fashion to fund SRS retroactively for 2016-2017 as the 115th Congress continues to work to provide hurricane aid, suppress wild fires and improve forest management with policies that protect natural resources and improve forest health and provide jobs.